Additional references can be attached to a shape through resource icon References, such as inserting a file, a folder and a URL. After that, you can open and view the inserted references through resource icon References. Move the mouse over a shape to add reference, click the resource icon References and select Add File... from the pop-up menu. Move the mouse over a shape to add reference, click the resource icon References and select Add Folder... from the pop-up menu. In the Select Folder window, select the folder to reference to and click OK. Multiple folder selection can be made by pressing Ctrl or Shift key. You may also enter the description for the folder in Description field. 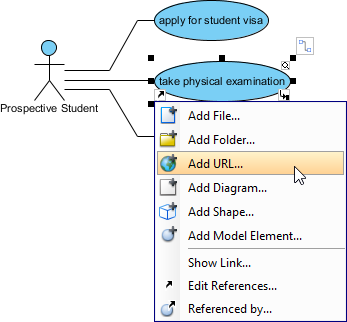 Move the mouse over a shape to add reference, click the resource icon References and select Add URL... from the pop-up menu. Move the mouse over a shape and press it resource icon References and select Edit References... from the pop-up menu. When the specification dialog box pops out, double click on the row of reference you want to enter its description or modify it. Finally, click Enter button to confirm editing. Move the mouse over a shape which has references, click its resource icon References and select Edit References... from the pop-up menu. 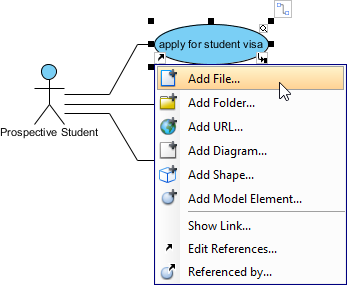 When the specification dialog box pops out, select a reference to be removed on the list and press Remove button to delete the selected reference.